Exclusive and one of the best interviews Eurolanche ever did. 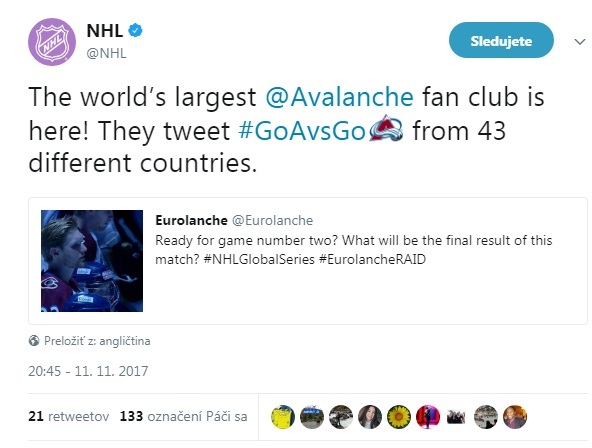 We talked with the new Avs member from the hockey-exotic Croatia. I used to introduce every person that I interviewed in few paragraphs before you could read a transcript. Now I will try to be brief. Why? The following interview with Borna Rendulic is one of my best that I have done in my journalistic career. I did dozens of interviews, but the content of this one speaks for itself. Borna is an amazing person, who really loves hockey and is willing to do everything to become an NHL player. He also loves to share his thoughts and hockey-life moments with his fans. Be sure to follow him on Twitter @bornarendulic and give a like to his Facebook page too. Borna was born in Croatia in 1992. At the age of 15, he made his professional debut in the Croatian top league and played for the same team, Medvescak Zagreb, in the Slovenian and also Austrian league during the following years (the team moved from one league to another at that time). Meanwhile, he also played hockey in Finland for the junior teams, which started his successful career there. He played his first game in the prestigious top-tier Finnish league in the 2011/12 season. His experience also includes some games in the second-tier Finnish league – he played for the same team that current Avalanche assistant coach Tim Army played for in 1980s'. Last season, Borna appeared in 57 games for HPK of the top league in Finland and collected 32 points. Finally, his international career is another great part of his life. He played in more than 60 games at international tournaments for the senior and junior Team Croatia. He hasn't missed any big international game since 2009 and last year almost helped Croatia to be promoted to top level of the World Championship for the first time in history. Borna has become the first Croatian player who was raised in Croatia and signed a professional contract with an NHL team. He is currently in Denver at the development camp; the interview was done last week. Was it hard for you to become a hockey player in a country that is still kind of exotic for this sport? Of course it was hard, that’s why I left Croatia when I was just 15 years old. I knew back then that I couldn’t succeed in Croatia and the only right path to become a hockey player was a departure to Finland. Why did you decide to become a hockey player? Who inspired you? No one special inspired me. 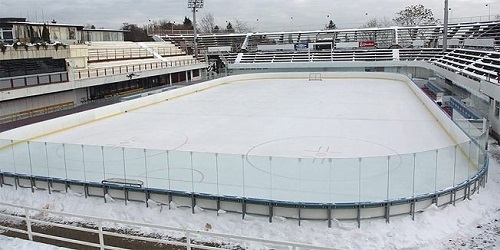 I just started to train hockey when I was six, some coaches in Zagreb saw me skating on the Šalata rink (in the picture below) and they invited me to play hockey. 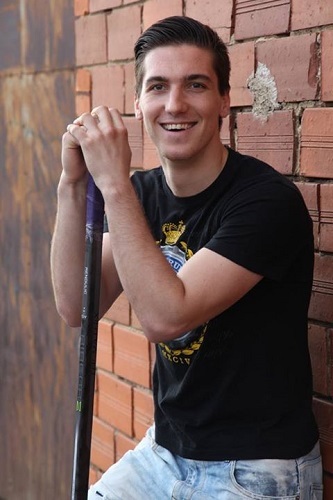 When I started to train, it turned out that I was very talented, so then I decided to continue with hockey. I was also very good at football (soccer) and since I knew I wanted to become an athlete, hockey was my number one choice and it has outweighted football, and that’s why I decided to become a hockey player. What was your favorite NHL team and player when you were a child? When I was a child, like any other kid, I liked Wayne Gretzky. But later I started to like the Capitals and Alex Ovechkin, who is my favourite player even today. But of course, the Avs are my favourite team today, since they gave me a chance to try myself out in the NHL. Was it possible to watch some NHL games or highlights when you were young or didn't hockey coverage exist in Croatia? Good question! The answer is no. There was none or just little NHL coverage in Croatia at the time. I watched NHL highlights on Youtube a little bit and I remember the 2002 Winter Olympics in Salt Lake City, but when I came to Finland, that was when I started to watch NHL hockey more often. You made your debut in the Croatian top league at the age of 15. How was it to play against adults at such a young age? I didn’t play the whole game back then. I know what game you’re reffering to. I remember that I played well that game for a couple of minutes, I scored a goal obviously, but then I made a huge mistake on our blue line and then the coach benched me until the end of the game, haha! But it was nice and delightful to play with adults with only 15 years of age. 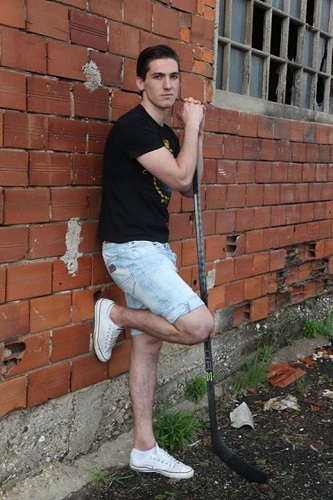 Borna is a very popular hockey player in Croatia. This is one of several front-page stories about him there. You played for the Croatian team Medvescak in three different national leagues. First they were part of the local league in your home country, then they moved to the Slovenian league and finally you also played some games during their time in the Austrian league. Can you compare these three leagues and your experience there? Well, it’s very easy to compare those leagues. They are all not so good. The Croatian league is mainly an amateur league. The Slovenian is much better and the Austrian league is a little bit better. However, EBEL has grown during the last couple of years and it has more and more quality in each new season. But all those leagues are leagues for players with 30+ years of age. You continued in Finland for different teams that mainly included teams from the top league. How and when did you get the chance to play in Finland? It must've been hard to get it for you as a player from Croatia, wasn't it? Yes, it was very hard to carve out a place in Finland, because I was from Croatia, a country with no hockey tradition. The additional obstacle was the European Union thing, since Croatia wasn’t part of the EU until summer 2013, so I was a foreign player in Finland. But I left all that behind me, didn’t think much about it and I got through all of it from the S-Kiekko (junior) team to HPK (top league). I got the chance to play in Finland when I was 15 in S-Kiekko, because they were collecting young talented players from all over the world and I got into the team when I was at a camp back then. In the top league, I was in juniors for Assat and I played several games for the senior team during two years, so Assat gave me the first chance to play in Liiga. But then an offer came from HPK, I said yes, and that’s when I got my first serious chance in the Finnish top league. 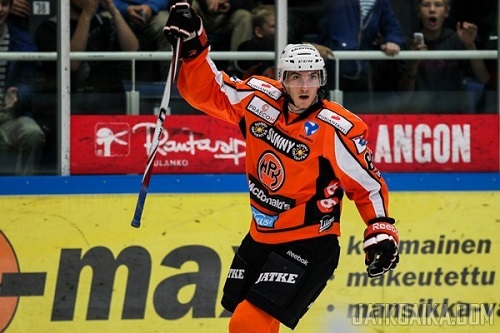 Borna in the jersey of HPK. Which game in Finland will you never forget and why? I will never forget my first game for Assat's senior team. God, I p****d my pants before that game. But it was cool, we played against Lukko Rauma, we won 6:3 and Joel Armia, my Finnish idol and a good friend, who is part of the Buffalo Sabres now, scored two goals. It was fun to watch and play that game, I will never forget those feelings. You played few games for the Peliitat Heinola of the second-tier league in Finland. Do you know that Colorado's current assistant coach Tim Army played for the same team in the 80's? Nope. This is the first time I hear about that, but it’s nice to know though! You've represented Team Croatia at the senior lever since 2009. Your team was promoted from Divison II to Division I one year ago and this year you were close to being promoted to the Top Division, but you ultimately finished second. You lost the key game against Poland. How do you remember this game? I personally think that we should have won that game against Poland, but they also had four good lines and they deserved to win that game. But on the other hand, maybe it’s good that we lost and stayed in Division I, because next year we wouldn’t have a chance to do anything in Top Division. Do you believe your national team has a chance to reach Top Divison next year? No way, but maybe in a few years. Now, when you've become a player overseas, have you realized it would probably be impossible to play for Team Croatia next year? It would be the first time that you wouldn't represent your country at any international tournament since 2008. Yes, I was aware of that all the time. But hey, they can do good without me as well, and I will come back to Team Croatia whenever I will be able to do it. As Croatia previously played in Division II, do you remember any very interesting games against some "exotic" opponent? For example, the Slovak national women's team beat Bulgaria 82:0. How does it feel to be the first Croatian player who was raised in Croatia and signed an NHL contract? Well that my friend is a feeling that can’t be described by words. It’s just thrilling and delightful, and a dream come true. Borna in Team Croatia's jersey. You got many other offers from several NHL teams. Why did you decide to agree to the Avalanche's offer? Well, I spoke with David Oliver from the Avalanche's management. We spoke a few times, he was watching me in Finland and I just liked the guy and he said they were searching for a player like me. I think that he can help me become an NHL hockey player. And of course, because of Joe Sakic, who is also Croatian if you ask me haha! Do you remember the day you signed this contract? Can you describe your feelings and what did you do to us? I knew about all of that few months before signing a contract, so when that day came, I was enthusiastic, but my friend was much happier than me, haha! Why do you think the Avalanche chose you? Did you know about some of their interest before they offered you a deal? I know they chose me because of my predispositions and style of play. They were searching for a right wing that is between 189 and 192 cm, that shoots right and is young forward. Have you ever been in Denver? 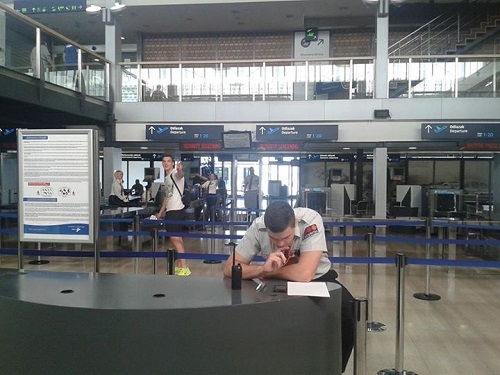 Borna at the airport in Croatia before his departure to Denver few days ago. Is Joe Sakic, a Croatian native, very popular in your home country? Do you often think about his life story? Yes, people in Croatia do know about him and he is a popular guy over here, especially in the last couple of years when hockey grew here. I do not know about his life story much, but it interests me, of course. Did anybody from the Avalanche organization told you what they expect from you in the next two years of your contract? No, nothing, but I know what I am expecting from myself. And that is to play the NHL! Do you think you have a chance to make the Avalanche roster? Yes. 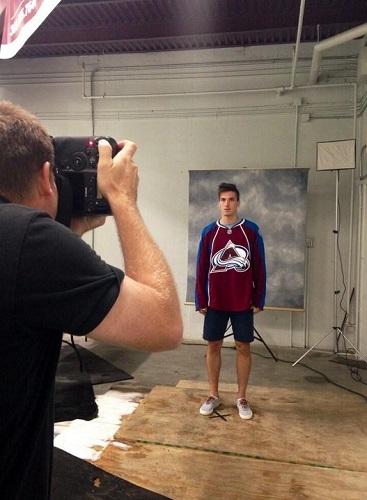 I know that I have a very small chance to make the Avs roster, but I will do my best to make it. However, I am aware of AHL opportunities and looking forward to that too. Can you describe your hockey style, your hockey skills and what you'd like to improve most to us? Well, I know I have to be better in skating and adding grit to my play. I also have to be better defensively. But other than that, I am a big-size forward, who likes to challenge opponents all the time on the ice. I have to learn how to shoot faster and from smaller angles, because I’m aware there is no space and time like in Finland there. Every coach said to me that I have a good shot, but I’m not using it well enough and that’s also something I have to improve. I know I have technique and that I’m a skilled player, and I think I’m very good on offense. What is your plan for this summer? When are flying to Denver? My plan this summer is already under way. I train my a** off and I'm doing my best to be in my best condition when I come to Denver to the development camp. Also, I’m looking forward to go back to Denver in September. What do you think about the opportunity to play under Patrick Roy and be in the organisation that is controlled by Joe Sakic? I heard that Patrick Roy is great coach who is fair to his players. I’m certainly looking forward to work with him and Joe Sakic, because I know they were great players, so it’s obvious that they are great people as well. What would you like to say to your European fans from the Eurolanche Fan Club, who wish you all the best next season? I would like you to cheer for the Avs as you usually do, take care and I hope I will make you happy when I first play for the Avs!